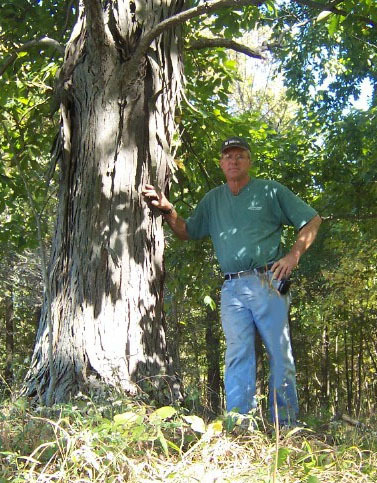 Choosing the perfect tree - Johan works with local wood lot owners to harvest trees that make furniture-grade wood. The density of the Shagbark hickory (shown at left) is especially suitable for table tops. 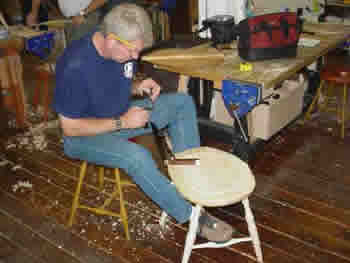 Also, the open grain of hickory lends itself well to steam bending for Windsor chairs bows. If a favorite tree falls in your yard - consider having it made into a meaningful piece of furniture - rather than cutting it for firewood! Contact us if you are interested in this service. Sawmill Day! After spending the previous year collecting fallen trees, Johan hires a portable sawmill crew to rough cut the logs. The wood is then air-dryed for approximately two years before it is dry enough to use. There may be maple, cherry, walnut, poplar, hickory, elm, white ash, or other trees sawn this day - it's always interesting to see what the trees look like as lumber. Once the logs are rough cut the planks are stacked and allowed to air dry outside for approximately one year - then stacked inside for another year to continue air drying. The chair spindles are made from green split wood (right). The wood must be green - still have plenty of moisture - to aid in the shaping process. Johan splits this wood for each chair as he needs it. The logs for spindles are "stored" in his backyard pond - they get so saturated that they sometimes sink! 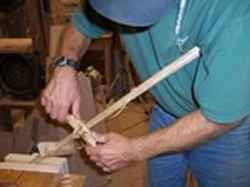 Once the wood is split, Johan begins shaping the spindle (left). The piece is secured in a vise and the spindle is rounded with a spoke shave. The spoke shave is a hand tool that removes a small amount of material with every pass. It is labor intensive, but the end result is a very strong spindle. Johan is shown here drilling the holes for the spindles. At this point the legs have been attached to the seat and the top portion is being added. A hand brace is used to drill the holes. Aligning and angling each hole properly takes a considerable amount of skill and a good eye. This is the way these chairs were made several hundred years ago.